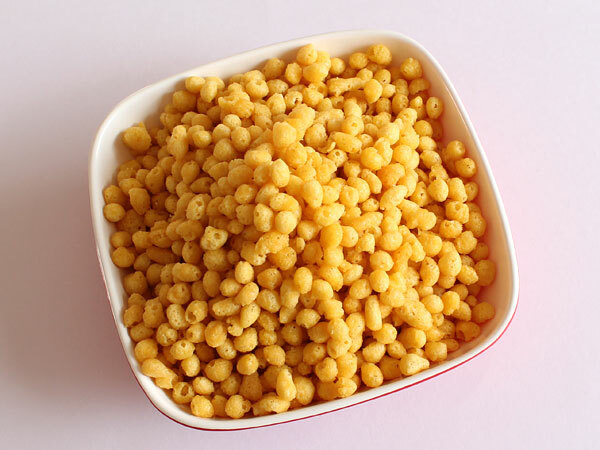 Boondi, a water droplet sized deep fried crispy Indian snack prepared from gram flour and few spices, is a main ingredient in making boondi raita and other snacks. Apart from using gram flour as base ingredient, this kara (salted) boondi recipe also uses rice flour which makes it extra crispy and gives delighting bright yellow color. Prepare batter by mixing gram flour, rice flour, red chilli powder, baking soda and salt in a medium size bowl and gradually adding water as required until medium thick (like dosa batter). Make sure that there are no lumps in the batter and it is not very thin or thick. Cover it with muslin cloth and let it set at room temperature for 10 minutes. Heat oil in a pan for deep frying. When oil becomes hot, hold perforated spoon (a big round spoon with multiple small holes in it) a little above pan and pour 2-3 tablespoons batter on it. Tap its edge so that droplets of batter fall in the oil. Repeat the process and make as many droplets as possible in a pan until all of them are able to remain submerged in oil and can be stirred easily. Stir them using spatula and fry over medium flame until they become crisp and attains bright yellow color. Do not over fry them; browning is the sign of over frying. Take out them using another perforated spoon, drain excess oil and transfer to plate. If possible spread kitchen absorbent paper on plate to absorb remaining excess oil. Clean wipe the perforated spoon and repeat the process for remaining batter. Sprinkle some chat masala on it and enjoy it as a standalone snack or store and use it for making raita. To prepare a lump free batter, first make a thick paste of gram flour by adding a small amount of water and stirring rigorously (like beating) and then add water as required while stirring constantly until smooth batter is ready. Properly heated oil is must for making crisp kara boondi. Check whether oil is hot enough for deep-frying or not by dropping a couple of drops of batter in it. If it comes to top surface immediately, then oil is ready. Be extra careful while dropping batter droplets through perforated spoon and make sure that you do not accidentally burn your fingers as well as hot oil does not splash on your skin. Use two perforated spoons to make and take out boondies from oil. The droplets size should not be very big but you can make it as small as you like it using appropriately sized holes in perforated spoon. Serving Ideas: It can be used as a base ingredient in many preparations. E.g. It can be used to prepare snack mixture, chevda (chivda), etc. Sprinkle some chat masala on it and savor it as light spicy chatpata snack. I have tried your recipes which came out very well. But I am a bit surprised you don't have MAKMAL POORI / STUFFED SWEET POORI recipe, chirote recipe etc which I would love to try. Response: Hi Priyanaka, I have added both the recipes in my do list and will definitely try to upload soon. Your website is a real solution for fulfilling my hobby of cooking. It is 100% helpful to me. Thanks a lot. I find every recipe which I want. I am loving it and enjoying it and also big thanks. It is amazing, I have found every recipe that I need. I like your website very much and it's very easy to see and cook. Thank you for the website.